In this world of Internet era, almost everyone wants to create theirs own web presence by either hosting their own blog, articles, photos, videos, reviews, etc etc . But some people choose their own way and decide to have something bigger! What is it? 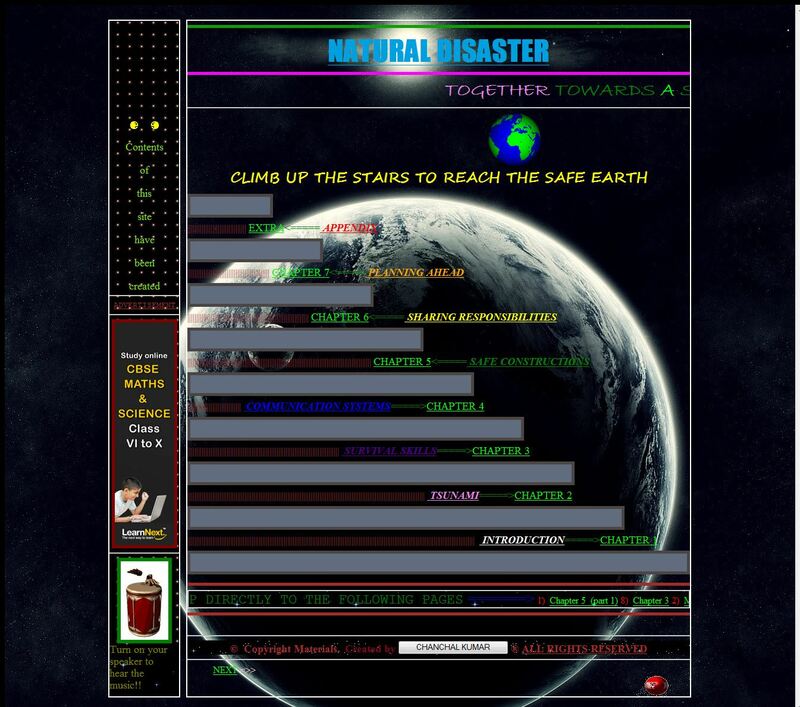 Its a website! It feels so cool to have a website under your own name or group, so that you can proudly walk forward to your friends and say "Yes, I have my own website". And your friends standing with their mouth open thinking "Oh my god, this guy is wonderful, he has his own website!!". But the truth is that this things no longer happen because having a website is now as easy as having humans around you...lol! 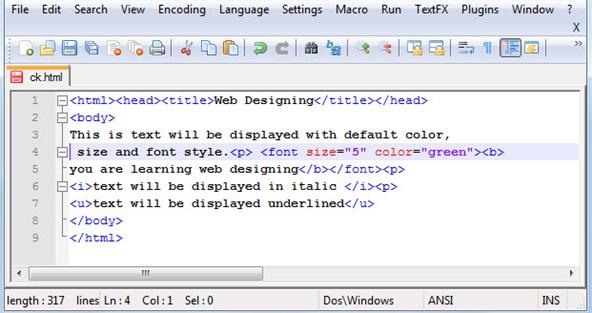 Here you will learn how to create web pages using basic HTML knowledge. But if you are very creative and doesn't stop experimenting then you can create amazing web pages by just knowing the information provided here. 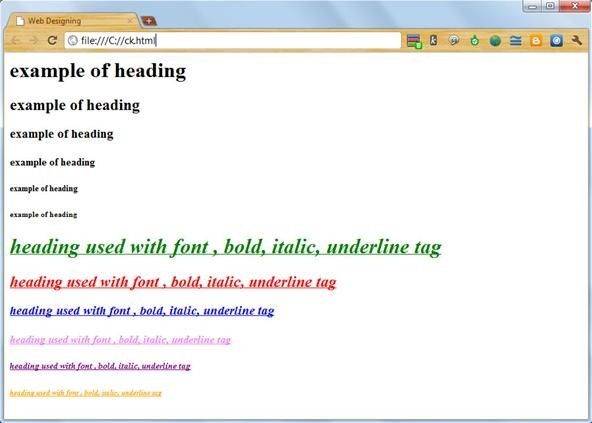 HTML ( Hyepr Text Markup Language ) is the language used to create webpages. Almost everybody who is involved with the internet or web designing needs to have a basic understanding of how HTML works or HTML codes are written. 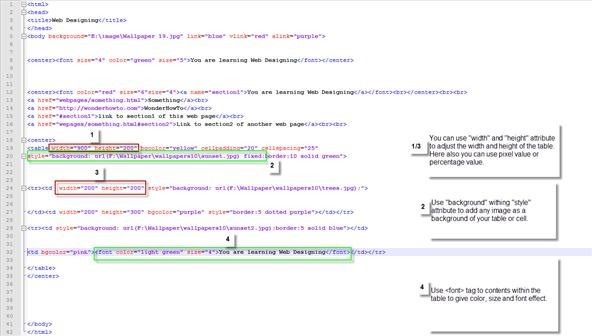 An HTML file contains "markup tags" that tell the browser how to follow instructions within these tags. 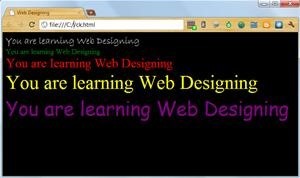 Now from here we start our journey to Web page designing just using Very basic HTML programming. I recommend you to write each and every HTML code you see here or anything you learn from it by your own so that you can learn it very quickly. 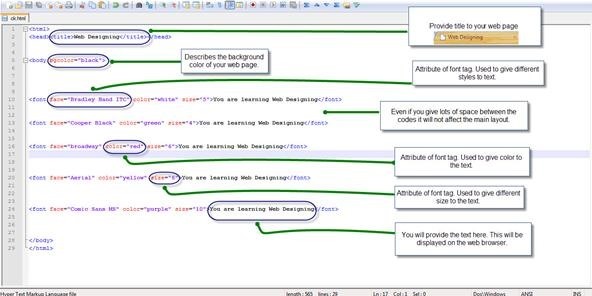 Editor- First of all you need a editor program on which you will write your HTML codes. 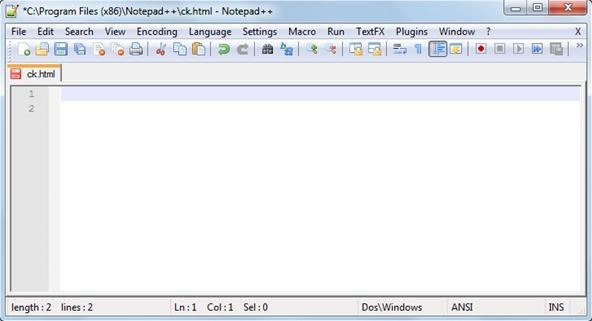 I recommend you to use Notepad++ ( a free program ), its very easy to use and you can easily manage your complex HTML codes with ease as it show HTML tags, attributes and contents with different colors. Image Editor - Well you don't need any software for editing image or any other software like Photoshop for graphics because we will be using Internet to get all our resources that we will use on Web Pages. Creative - You should have very creative thinking and should not stop experimenting. If you have these then you can surely make amazing web pages just by using basic HTML. 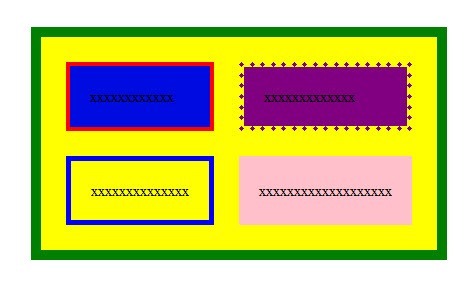 Every Web page starts with the <html> tag telling the web browser the start of the HTML document and ends with </html> which indicates the browser that it is the end of the HTML document, there are even more tags which you will be learning further, but one thing which you will see that these tags <html>, <body> etc are not displayed in the web browser. The browser only displays the content between the tags, but the tags themselves are hidden. Container tag/Non-Empty tags - Container tags are also known as Non-Empty tags. These types of tags requires opening as well as closing. Example: <html>, <head>, <title>, <body>, <i> these types of tags requires closing. 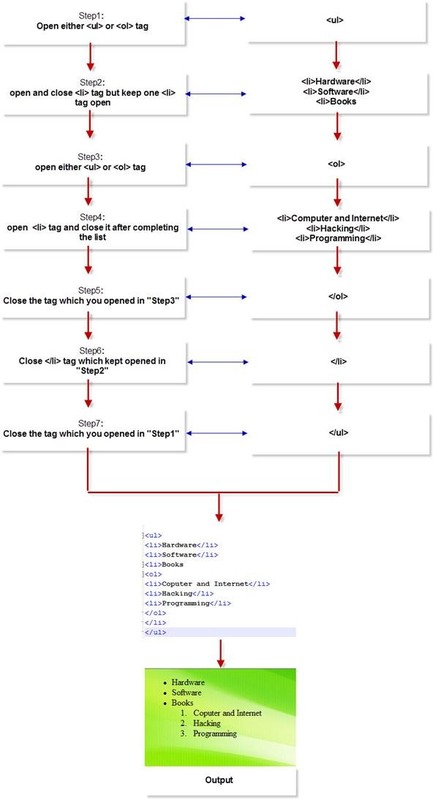 Example: </html>, </head>, </title>, </body>,</i> are the examples of closing tags. B. Empty tag/Non-Container tags - Empty tags are also know as Non-Container tags. These types of tags don't requires closing even if you have opened it. The following example will make it clear - Suppose if you want to have background color of your web page as black then you will use "bgcolor" attribute within the <body> tag. As you have already saved it with .html extension ( if not done then do it now ), you just need to click on "Save" option from "File" menu on the menu bar. 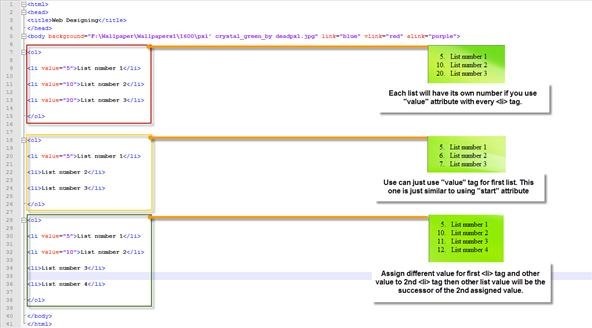 As you can see main tags have "light blue" color, contents that are displayed on web browsers have "black" color, attribute have "red" color while value of attributes have "purple" color. This is the main reason why we use Notepad++, you can easily distinguish all stuffs very easily. Open the saved file using any Web Browser. As you see here that all the text are in written in one complete line, but you can change it by using <br> [break tag. Its a empty tag] or <p> [paragraph tag. Its a container tag]. You need to use it just where you want to break the line ( <br> ) or from where you want to start a new paragraph ( <p> ). Font styles are only displayed by web browsers only if the user have that font styles installed on their computer. Many computers may not support the font styles you use in your web pages, so you should use the most common font styles. 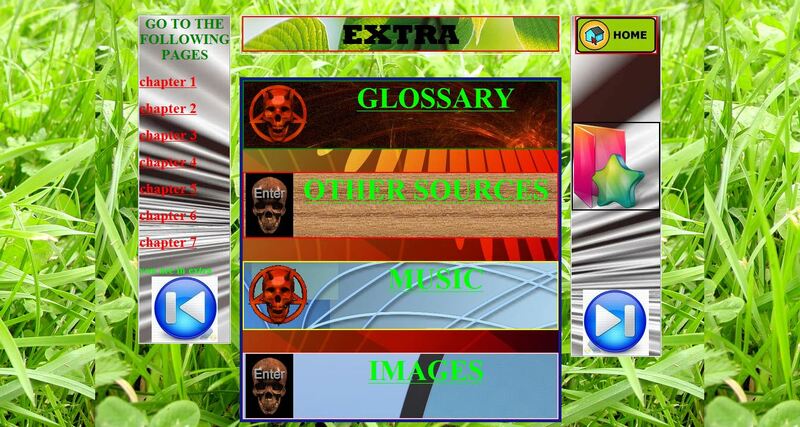 Now you have learned how to assign size, color, face to your text in web pages. Now let us learn how to make text look BOLD, italic and underlined! To make text look Italic in your Web pages use <i> tag. Its also a container tag so you need to close it every time you open it. To make text look underlined, you have to use <u> tag. Its also a container tag. While using two or more container tags on text, you should take very care while closing those tags. Suppose you opened <font> tag for a text before <b> tag then you should close that <b> tag first then <font> tag. The grater sign in opening pattern of tags shows that "tag A" have be opened before "tag B" and "tag B" have been opened before "tag C"
And the less than sign in closing pattern of tags shows that "tag A" have been closed at last, "tag B" have been closed just after "tag C" while "tag C" has been closed at the first. 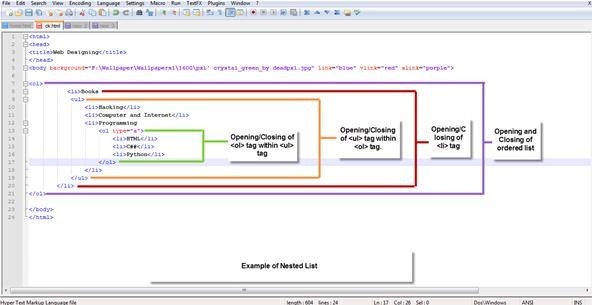 here also the closing pattern of tags is just opposite the opening pattern of tags. 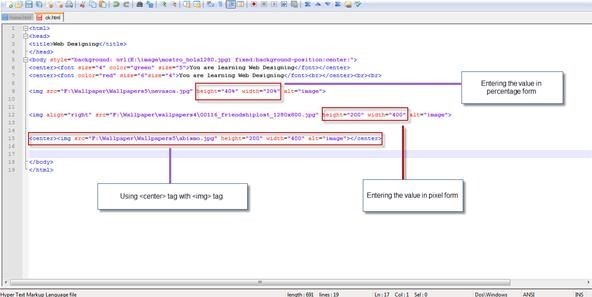 You should also know that use of attributes in any tags will not change this method. As here size attribute of font tag doesn't change the closing pattern. Here you will replace "image source" [without the quotes] with the complete path of the image. Here something.jpg is your image name with .jpg extension. You can even know the compete path of your images by opening it with internet explorer. You can do it by right clicking the image and selecting Internet explorer or any other browser from the open with option. You can use "bgcolor" and "background" attribute at the same, just to ensure that the web browser displays the color assigned if it fails to show the background image. You can choose any size and color of your border but remember to use "solid" or "dotted" before color name. You can simply use <embed> tag to add videos. If you change the "autostart" value to "true" then your video will start playing as soon as you open your web page. Here "loop" represents the number of times you want to play the audio. You can use 0, 1 ,2 or any other number, depending on your interest. 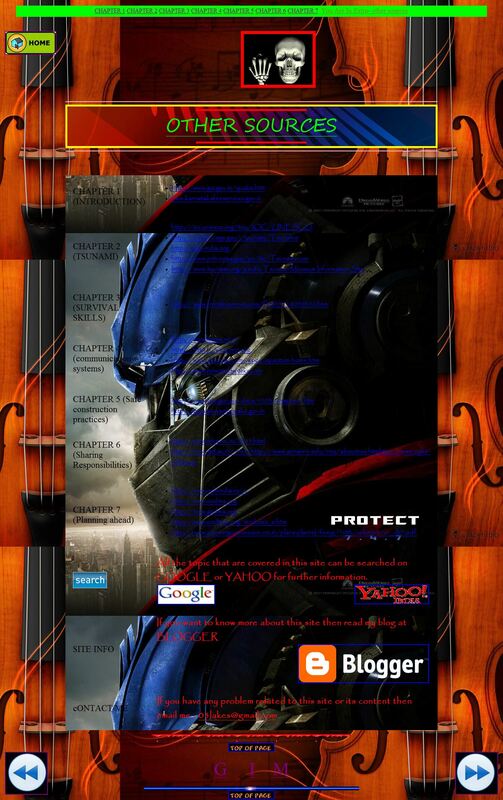 Using <bgsound> tag will not add any music player to your web page but still you will be hearing it. To make any image clickable, you just need to use <a> tag before the <img> tag. 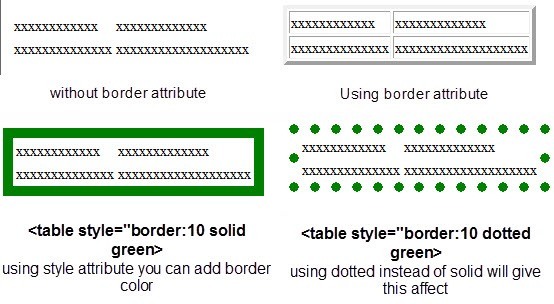 If you will use "border" attribute then assign it some value then the table will be displayed with borders but if you will not use "border" attribute, the the table will have no border.You can also assign different colors to border. 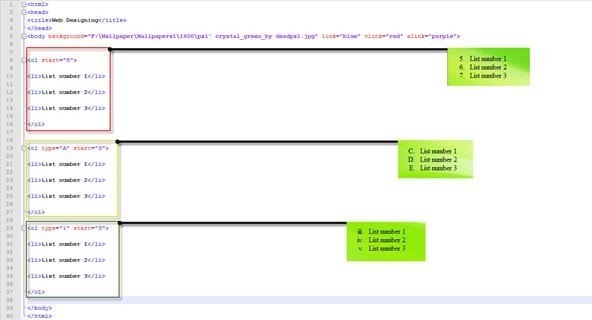 If you want to give different border size and color to each cell, then separately use "style" attribute with <td> tag. 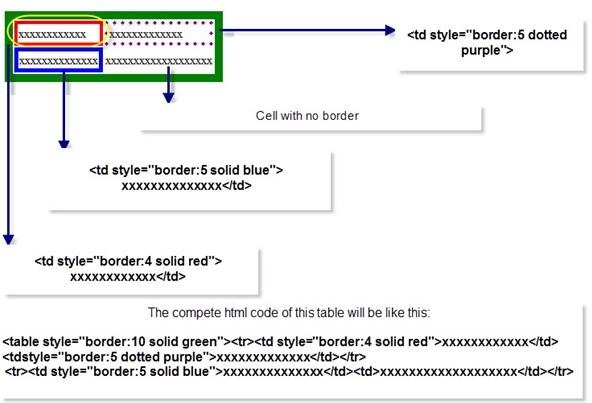 Cellpadding is an attribute of <table> tag. By using cellpadding attribute you can set the amount of space between the contents of the cell and the cell wall. Cellspacing is also an attribute of <table> tag. By using cellspacing attribute you can set the amount of space between the table cells. You can background color to your table and cells simply by using "bgcolor" attribute. If you think that adding colors as a background in you table is not so appealing, then no problem. You can use background attribute to add any images as background of your table or to each cell separately. See image for more reference. An unordered list starts with the <ul> tag and each list item starts with the <li> tag. 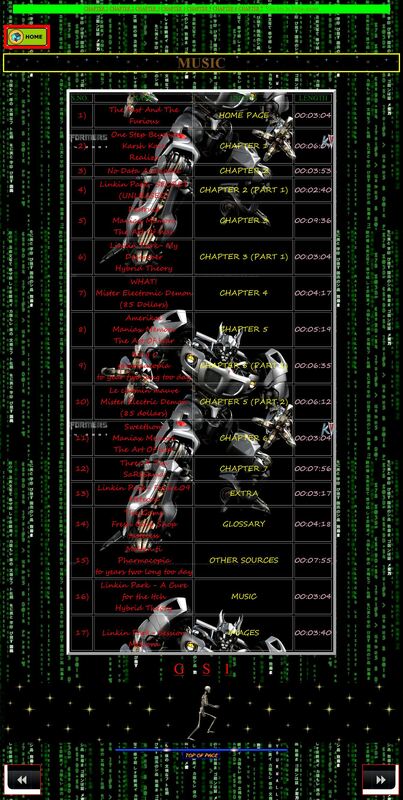 Output:- All the list items written within <li> tag will be displayed with bullets. If you want to change the shape of these bullets from circle to square then use "type" attribute. Output:- Try using "disc" value in "type" attribute! 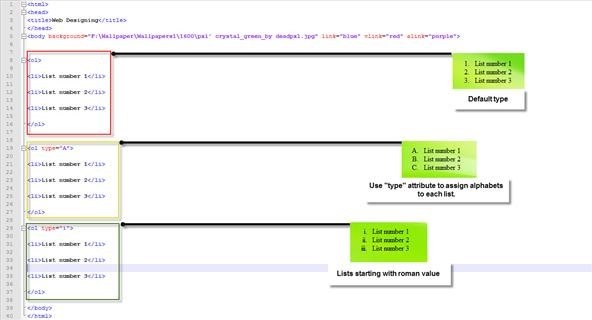 An ordered list starts with the <ol> tag and each list start with <li> tag. 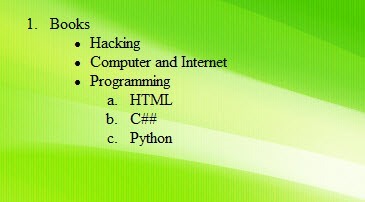 Suppose you want to start your list with number 5 or any alphabet C instead of 1 or A, then try using "start" attribute. Every definition list start with <dl> tag and ends with </dl> tag. Nested list is not any new type of list but a combined use to unordered list and ordered list. 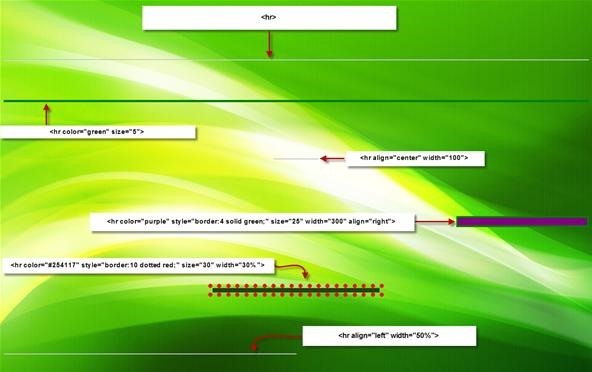 If you want to add a horizontal line in your web page, then you have to use <hr> tag. Its a non-container tag, so you don't need to close it. By using <marquee> tag you can make text, photos, horizontal line and many more things scroll horizontally or vertically automatically. Scrollamount:- Scrollamount attribute defines the value by which the content withing <marquee> tag should move. Here "vspace" means "vertical space" and "hspace" means "horizontal space". 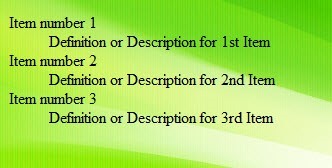 Assigning value to these attributes will leave space vertically and horizontally. You can also add <marquee> tag before <hr> tag to make it scroll in any direction. You can use <marquee> tag for creating sliding images. Use <sub> and <sup> tags to give subscript and superscript affect to any text or number. Generally, these tags are helpful while creating Science subject (mathematics, physics, chemistry, etc) related web pages. I should now stop here because this article has already reached more than 5 thousand words and if I keep writing then this article will no longer be called as "How-To-Design Amazing web pages using basic HTML" but may get a tag of "Basic Web Designing Manual". But, you now know almost very much of the basic HTML. Just Go and keep experimenting and exploring with your existing knowledge! 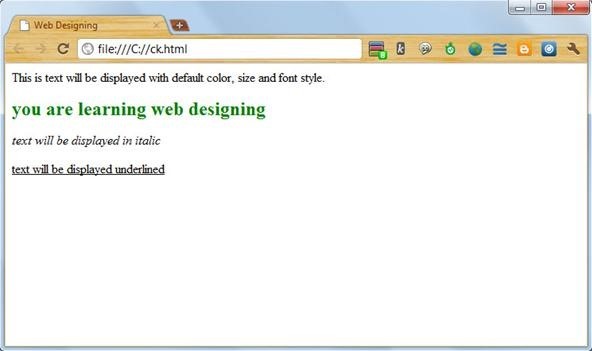 Amazing article,I understood how to create a web page in a easy way...Thanks for explanations.